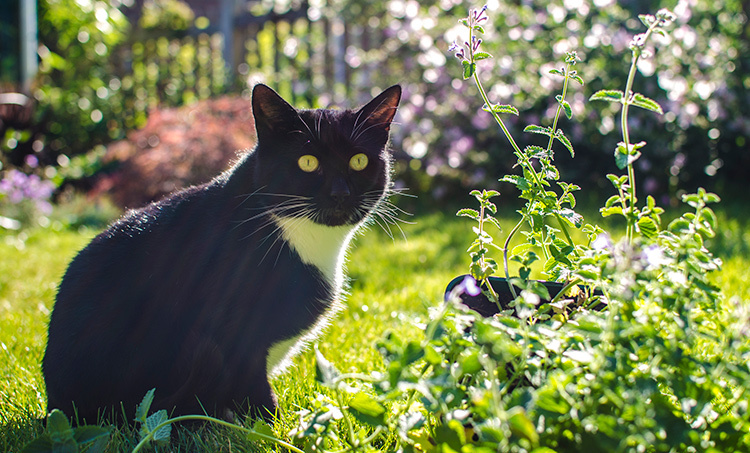 Plants like catnip and cat mint should be the first choice for gardeners with cats - and you can grow catnip yourself at home! Catnip is easy to find in the spring. Most garden centres sell it, along with other herbs. Mail-order nurseries are also a good source. However, be sure that you do not buy an ornamental catnip by mistake - it's no use to cats! If you choose to grow your plants from seed, start about eight weeks before the last frost in your area. This is usually around the end of May. Start the seed in two-inch pots, using sterile potting mix. Moisten the soil mix, press the seeds lightly down, and cover with a tiny bit of mix. Cover the pots with plastic, and keep warm. Expose the young plants to full sun as soon as they start sprouting, and do not allow them to dry out. What are catnip's growing needs? Full sun, ample moisture, and reasonable soil are all that is required. Catnip will grow happily in patio pots. The worst damage usually comes from outside cats that discover the plants while young and vulnerable. Catnip can survive long periods of drought once it is growing well. In fact, this can intensify the aroma by concentrating the essential elements that sends cats mad. You can begin harvesting catnip as soon as the stems get to about one foot tall, and continue cutting all summer. Cut the stems when morning dew has evaporated and hang upside down in an airing cupboard. When completely dried up and crunchy, crumble the leaves into a paper bag and throw away the stems. Store in plastic bags safely locked away - if they're easily accessible your cat will do its utmost to get at it! This dried catnip can then be stuffed into toys or rubbed on scratch posts for renewed interest.